Pennsylvania’s dense traffic code can make it hard to figure out when it’s legal to ride with a passenger. 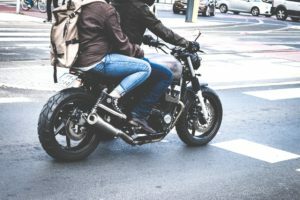 Fortunately, motorcycle enthusiast and auto accident attorney Brad Tabakin is here to answer common PA motorcycle laws passenger FAQs. Brad Tabakin has spent his career fighting for biker’s rights and securing six- and seven-figure settlements and verdicts for clients. Want a free case evaluation? Call us at 877-333-0300 today, and don’t forget to join our Facebook group to keep up with the Bikers Have Rights community. Must My Passenger Wear a Helmet? Unless you are at least 21 years old, have been licensed to drive a motorcycle for at least two years, and have completed a safety course approved by the Motorcycle Safety Foundation or PennDOT, you and your passenger are both required to wear helmets. All passengers under the age of 21 must always wear helmets. Take note: In most cases, you and your passenger will be required to wear protective eyewear. However, if you are riding a three-wheeled motorcycle with an enclosed cab or a motorized pedal cycle, you and your passenger are exempt from this requirement. How Do I Prepare My Bike for a Passenger? Your bike may not be designed to carry passengers. Check if the seat is big enough to accommodate more than one person and if there are extra foot pegs for your plus one. Don’t forget to read your owner’s manual to make sure you aren’t exceeding weight limitations, using incompatible or unsafe equipment setups, and going against operation recommendations. What Are Your Safety Tips for Riding with a Passenger? Wear a helmet and protective eyewear. Were you injured in a motorcycle accident? Brad S. Tabakin is a personal injury lawyer and rider himself and has the knowledge and experience to help you pursue the maximum compensation. Call 877-333-0300 to get started.